A seven-day celebration of spaceflight and exploration kicks off Friday (Oct. 4), with hundreds of events scheduled in scores of countries around the world. The 14th annual "World Space Week" runs from Oct. 4 through Oct. 10 — both key dates in space history. 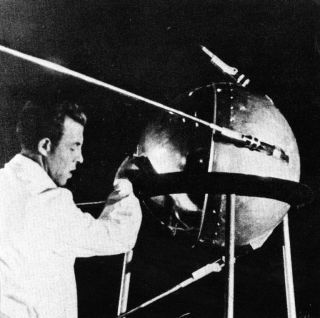 The Soviet Union launched the world's first artificial satellite, Sputnik 1, on Oct. 4, 1957, while the Outer Space Treaty, which serves as the foundation of international space law, came into effect on Oct. 10, 1967. World Space Week always has a theme, and this year's is "Exploring Mars, Discovering Earth." Events will focus on Red Planet exploration, and what such efforts have taught humanity about its home planet. One highlight occurs on World Space Week's first day. On Friday, key personnel from the European Space Agency's Mars Express mission will discuss what scientists have learned from the spacecraft's 10 years (and counting) in orbit around the Red Planet. Mars Express project scientist Olivier Witasse and spacecraft operations manager Michel Denis will participate in a live Google+ Hangout with the Planetary Society's Emily Lakdawalla, starting at 10 a.m. EDT (1400 GMT). Another interesting event comes on Monday (Oct. 7) at 2 p.m. EDT (1800 GMT), when Commercial Spaceflight Federation president Michael Lopez-Alegria takes part in an "Ask Me Anything" session on the popular social-news site Reddit. World Space Week was declared by the General Assembly of the United Nations in 1999 and first held a year later. The event is "an international celebration of science and technology, and their contribution to the betterment of the human condition," according to the World Space Week website. The 2012 version was the biggest World Space Week ever, officials say, with 685 events held over 66 nations. To see what events are being held this year in your location, check out the global calendar here.